Take in Cairo’s atmospheric neighborhoods and scenic riverfront with a 4-hour evening walking tour with a carriage ride. Enjoy the evening air as you pass Cairo’s most elegant homes and buildings in the carriage, then continue on foot to see downtown’s important sites. Join families and couples out for an evening stroll as you walk past Tahrir Square, and enjoy the view as the city lights up after dark. See the beautifully illuminated Egyptian Museum, then stand at the foot of the glittering Cairo tower before returning to your hotel. 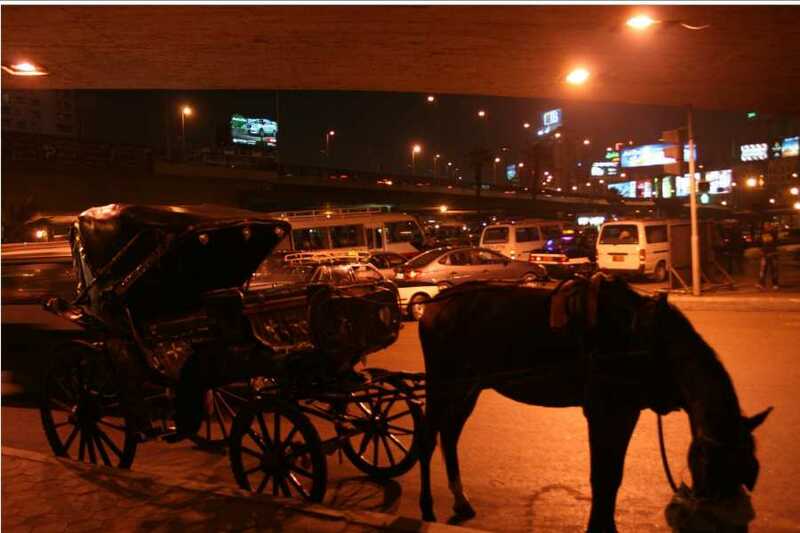 Your guide will pick you up at 6pm from your hotel in Cairo or Giza, and will transfer you downtown where you will get on a horse carriage accompanied by your guide. He will explain the places you pass, for example one of the richest areas in Cairo where diplomats live, and the beautiful Corniche along the Nile river. After the horse carriage ride go on a walking tour with your guide. He will show you downtown, with the modern shops and malls. Pass El Tahrir Square and the Egyptian Museum, and have an ice cream on the way if you like. Marvel at Cairo Tower, which is one of the highest buildings in Egypt. Your guide will transfer you back around 10pm.